What is it about summer reading lists? It's almost impossible for me not to make one and then equally impossible to stick to it! Ah, well... no matter. Lisa and Ti recently shared their lists, so I figure it's not too late to post mine. I hope to read these book by Labor Day. It will be a small miracle if I actually read all of these books. I typically pick up other titles on a whim or won't feel like reading like reading a few of these by late August, but at least it's a starting point. Do you make summer reading lists? More importantly, do you stick to them? Patty - Yes, that's the right attitude! Glad you loved The Wife... that will probably be my next book. I've read Pachinko and Educated and loved both of them. Kathy - I started Pachinko a couple of days ago and love it already! The Thrity Unrigar book is the one I'd like to track down fast! sounds very good. Mystica - I've been meaning to read it for literally years. Several months ago I purchased it as a kindle daily deal... now there are no excuses! This is a great list! And it doesn't really matter if you stick to it or not. The act of making the list is just so much fun. Ti - I cannot resist reading other people's lists or making one of my own... will actually be pretty happy if I read half of these! I'm good at making lists and really good at not sticking to them. Educated is one of the books I constantly recommend. Good luck with the list! Diane - I have high hopes for Educated... definitely sounds like my kind of memoir! I just finished The Great Believers and loved it, and just started Killers of the Flower Moon. Amy - I have high hopes for The Great Believers! I hope you enjoy it as much as I did! I really got deeply invested with the characters. I even cried a little, and I hardly ever do that with a book. Killers of the Flower Moon--definitely an eye-opener for me, as I had never known about this particular, horrifying chapter in U.S. History. Worth it. Educated: A Memoir is probably so far the best book I've read this year. Just buckle your seat belt! Judith - Glad you can recommend both of my nonfiction selections! The library hold list will determine which one I read first, but am pretty sure I'll get to them both this summer. I started making seasonal reading TBR lists last year (as part of a twitter thing), I've been reasonably successful with them, getting maybe half read, I see it as a way of reminding myself of books that I want to read (really) soon rather than a definite road map of my life to come. 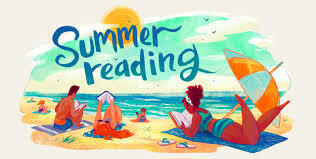 You've got a great summer of reading to come. I've only read Tin Man from your list, a quick little read, very enjoyable (although I liked it (a lot) I didn't LOVE it like everyone else seems to). Louise - That's a great approach to reading lists. The initial reviews of Tin Man were overwhelmingly positive, but I've been seeing more tempered positive reviews lately. Looking forward to it! I've been recommending Educated and The Great Believers constantly. Both are excellent. They'll be among my favorites this year. Melissa - So glad to hear that! I'm getting close to the top of the hold list for The Great Believers. I am a compulsive list-maker, though when it comes to reading lists I rarely follow them exactly. I did make a list of 15 books I wanted to finish this summer, I think I've completed five so far and am partway through two others, so I might actually complete it! It's early days though, so my head might get turned by something new and shiny. I do want to read Pachinko but hopefully my book group will choose it, so I might hold off reading it. I'm interested to know what you think so I do hope you get to that one. I've also wanted to read The Wife for a while, I think it's being adapted into a movie so that one will be around the blogosphere soon. Karen K. - I'm reading Pachinko now. At the 20% mark, I'm loving it! Seems to be one of those family sagas you can lose yourself in. Great ones on this list! Loved Great Believers, Educated, and The Wife! Sarah - I just got The Wife from the library, so it's up next. Love Meg Wolitzer's novels! Pachinko and Educated are on my tbr pile for summer too. Happy reading. vvb32reads - Hope we both get to them. Happy reading to you this summer! I love making TBR lists, but rarely stick to them. I've gotten so that I go back and look at old lists (say, for instance, the Paris in July event) and take the unread books from those lists to add to my new list. This way I'm bound to read some from my ancient stacks, right? As far as your books, I loved The Space Between Us. I would love to read it again with my book club. I have Educated on my shelf and hope to get to that this summer. Les - Ha! What a great approach! I'm afraid if I go through my old lists, I'd be appalled by how few titles from any of them were actually read. Yes I love summer reading lists, but I don't finish them all. Yours is a great list and many of these I want to read too, especially Pachinko. I heard from someone that the Thrity Umrigar story was really good. I hope so! Enjoy. Susan - I'm approaching Pachinko as a read/listen combination and it's off to a very strong start! So easy to get lost in this kind of multi-generational family saga. Educated is on my TBR. I've heard raves about it and I'm going to try the audio version and am really looking forward to it. Pachinko is one I've heard great things about and I'm super curious about Killers of the Flower Moon. Anne Bogel recommended it a little while ago on her podcast and I've been wanting to read it ever since. Good luck with your reading list! Katherine - Everyone seems to love Educated. I've got both the print and audio on hold at the library, so we'll see which one I get first. Good luck with sticking to your summer reading list JoAnn, but more importantly happy reading! I have also made a list for the 10 Books of Summer reading challenge. Jessicabookworn - In the end, I will be happy if I enjoy the books I read this summer... whether they are from this list or not. I've already started Pachinko and am enthralled after 150 pages! Top Ten Tuesday: Listen to This!